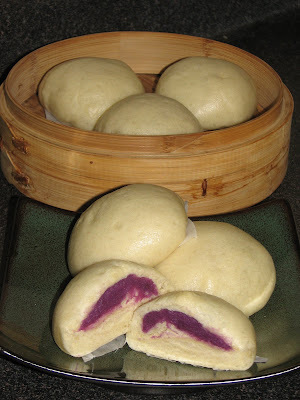 Hmmmm....I miss my sio pao, and for that, I decided to made some. Sio Pao is a famous snack in the Philippines. It's a good food on the go and very affordable. Making sio pao is not complicated at all even for first timers. You just need to be time conscious when you're waiting for the dough to rise, otherwise you'll over grow the dough, and this can really affect the texture of your dough resulting to a dry and heavy buns. When deciding on what fillings to make for the buns, just feel free to experiment, or I may say, do as you please. I decided to do a sweet filling which is made of sweet purple yam just because it's my favorite,lol! For my filling, since I use a powdered purple yam, I just followed the instructions on the packaging. However, for a salty filling, you can use a some scrambled tofu,minced cabbage and carrots. Just stir fry it, add some soy sauce and any spices you like, but make sure that it's not liquidy to avoid any problems with the dough. 2. Mix together the yeast and sugar in a lukewarm water and stir until it's lump free and wait till its bubbly. 10.Place the bun into a 4"x 5" square parchment paper and cook in the steamer for 15 minutes.